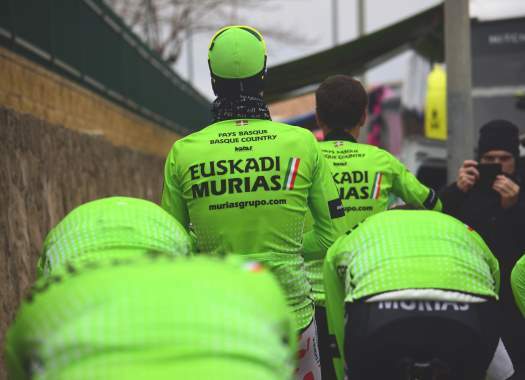 Oscar Rodriguez (Euskadi-Murias) won his first stage in a professional level in a surprising move after being in the breakaway and attacking at the last kilometre. The 23-year-old overtook Rafal Majka and Dylan Teuns at the last kilometre of the stage and went on to take this important victory for him. "I still can't believe it," said the rider to Spanish broadcaster RTVE at the end of the stage. "I didn't think that a professional victory was at my reach and even less at a Vuelta a España. "I had the power metre and I tried to keep it constant and little by little I started catching riders. First (Rafal) Majka and then the other one (Dylan Teuns) and then I saw that I could go a little be faster and I just kept going." It was when he overtook the two riders that the Spaniard started believing that he could take the victory. "When I overtook them I saw that they were suffering and I said to myself 'maybe I can win'," Rodriguez explained. "From the car, they were telling me that the stage was mine but at the end, I lost my earphone and I couldn't hear them anymore but just before they were supporting me. Rodriguez was meant to climb this mountain last year, but an accident stopped him from doing so, and today he could take back that chance. "Last year we climbed this mountain at the Vuelta a Castilla y Leon but at one of the descents I fell and I injured my face and I had to abandon the race. Today I got to take the win in this place, destiny had this in store for me."